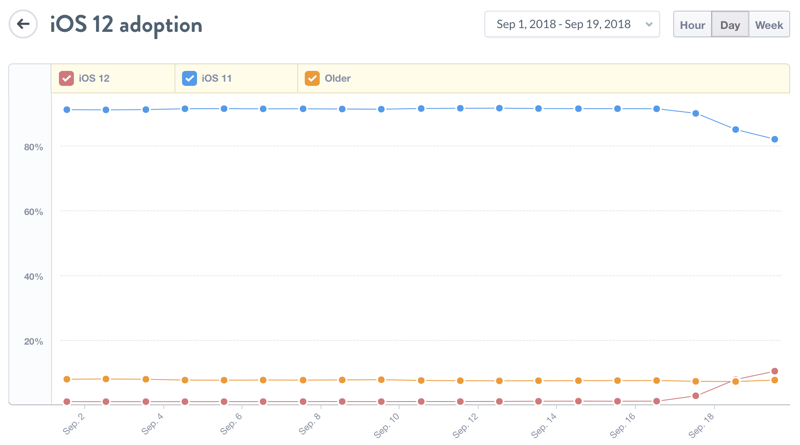 Given how iOS 11 turned out to be, it’s not surprising that people are a little reluctant to update their devices to iOS 12.
iOS 12 is a huge update when it comes to performance improvements, especially on older devices. But after just 48 hours of its release, the OS is installed on just 10% of total devices. If you compare things straight with iOS 11, the OS was installed on 10% of devices in just 24 hours. In 24 hours, iOS 10 was installed on 14.45% of devices. These numbers come courtesy of Mixpanel. The drop in adoption rate is understandable from iOS 10 to iOS 11 as the latter axed support for 32-bit devices altogether. But given how buggy iOS 11 turned out to be at launch, one can deduce that users aren’t ready to risk it all this time around and update to iOS 12 just yet despite the OS being as polished as possible especially in the performance department. Will these numbers improve drastically in the coming days? Well, we’ll only know once we have more data in our hands. It would be interesting to see if Apple chimes in at one point in iOS 12’s lifecycle regarding its adoption. iOS 12 takes huge strides in the performance department, especially on older devices like the iPad Air, iPhone 5s and even the iPhone 6. Apart from that, users can expect a bunch of new feature additions too such as Siri Shortcuts, group FaceTime calling (coming with iOS 12.1) as well as Memoji. There is a list of improvements under the hood too that ensure you get an overall wonderful experience on your iPhone and iPad.